Wairarapa Planning Committee: The Carterton District Council in conjunction with the Masterton District Council and South Wairarapa District Council have established the Wairarapa Planning Committee. The purpose of the Committee is to promulgate a District Plan to cover the three regions. The Committee comprises two members from each authority plus supporting Council Officers. Wairarapa Library Service: Is made up of elected members from the Carterton and South Wairarapa District Councils. The purpose of the Committee is to set policy for the direction of the Libraries in the two districts. Rural Travel Fund Committee: The responsibility of the Rural Travel Fund Committee is to administer funds received from SPARC for travel costs associated with club sport in the district. 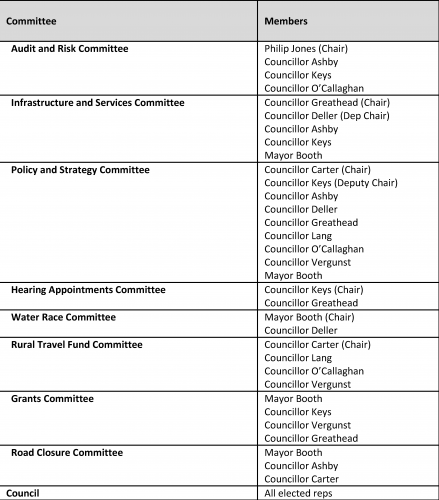 Water Race Committee: The Committee is made up of elected members of the Carterton District Council and community representative elected by water race users. The purpose of the Committee is to manage the district’s water race system. Civil Defence and Emergency Management Group Joint Committee: Comprises the Mayors of the Wellington Region and Chairperson of Greater Wellington Council. The purpose of the Committee is to provide governance and strategic direction to the Wellington Regional Civil Defence and Emergency Management Group.